The PPW Facebook and Twitter have taken up most of my social media time, and I realize I haven't made an update on this poor neglected site in two full years! But that does not mean, friends, that work has not been done. Since I'll probably continue to be terrible at updating this blog, I'll give a nice overview of where we're at now. 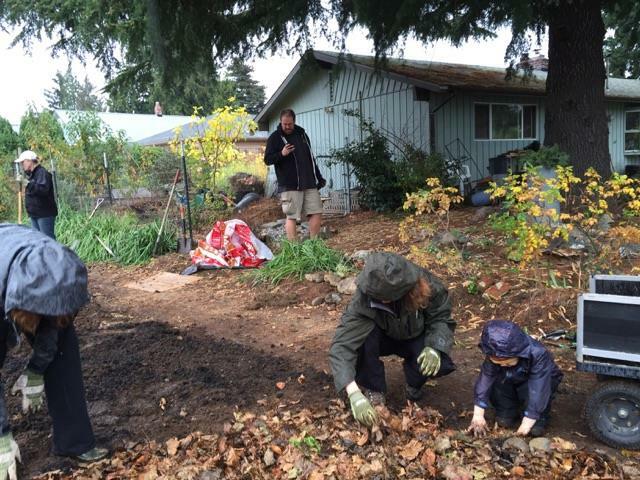 In three years I have worked with neighbors in and around the Montavilla Neighborhood in Portland to create nearly 60 new pollinator habitat sites. Additionally a large site was installed in Newport, OR. All totalled through this project we have created over 11,000 square feet of pollinator habitat where once there was nothing of wildlife value. Metro, Bureau of Planning and Sustainability, East Multnomah Soil and Water Conservation District, Awesome Portland, and dozens of individual donations. City Repair Project has provided me fiscal sponsorship so that I can apply for grants without going through the expensive and tedious process of becoming a 501(c)3 myself. My goal is to continue to do this project as long as I have capacity to do so, with a goal of flipping 3,000-5,000 feet a year! There's been no lack of interest in the project - in fact quite the opposite. Interest has grown as people see more and more examples in action. Thanks to Portland Awesome Grant, I have the funds to convert 1,000 square feet of space into pollinator habitat for those unable to pay for a project themselves. I've also applied for a Metro "Nature in the Neighborhoods" grant, which would allow another 3,000 square feet of space to be converted. Some of that will go to a church, another section to a school, but the rest will be residential parking strips. I've been pretty poor about updating this blog, with so much of my time going to running the Facebook page. But I'd like to be better about it! Expect more updates soon! We had an awesome time on Saturday and Sunday in November, converting 6 parking strips into 1,500 square feet of pollinator habitat! Additional people took their strips on themselves, adding another 1,500 sq ft of habitat for pollinators. 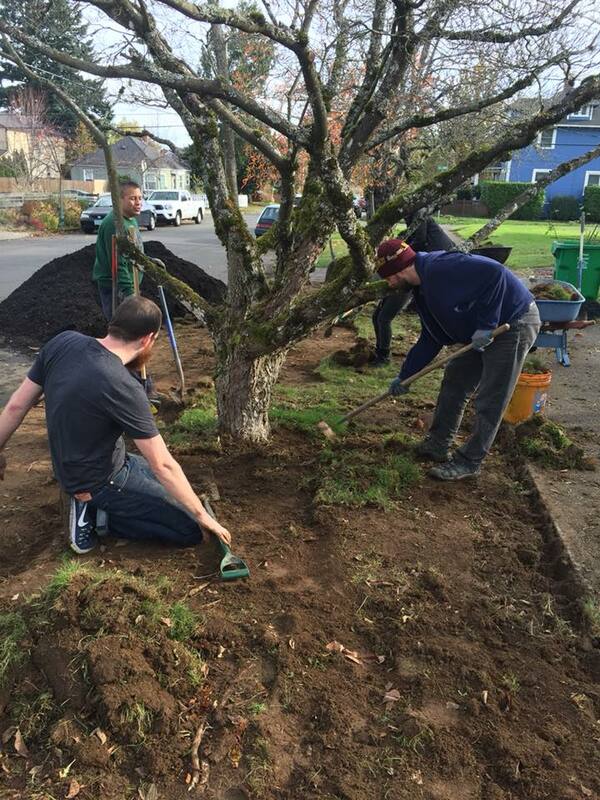 20-25 volunteers came out in torrential downpours to dig up sod, replace it with compost/soil, and put in $500 worth of organic, native plants, courtesy of a City of Portland grant. We had a great time and are excited to see what the strips will look like this spring! The most exciting thing is the release of our DIY Manual, which can be viewed HERE! Hopefully this will help people to design their own parking strips. Meanwhile, we have chosen our volunteer days! November 7th and 8th from 9am-12n. We could really use help digging, putting in new soil, and planting. We have a lot of participants with large strips or with physical limitations to physical labor. Have a “practice run” of the project at a small number of businesses, community centers, churches to test logistics and possibly raise a little money. Why do people want to do this project? After recruiting on nextdoor.com and the Gardeners for Montavilla Facebook page, we had a small meeting at a neighbor's house. What started as a wildlife corridor idea turned into something much more inclusive. How can we include people? How do we reach beyond “the choir” and make an accessible project? Ask people to go pesticide free and support wildlife! Have some pre-drawn schematics with themes like “minimum maintenance” and “Drought tolerant,” “Butterfly Meadow” or “Bring on the birds” using themes that would suit people and allow for variety of approaches and styles while making things easy. 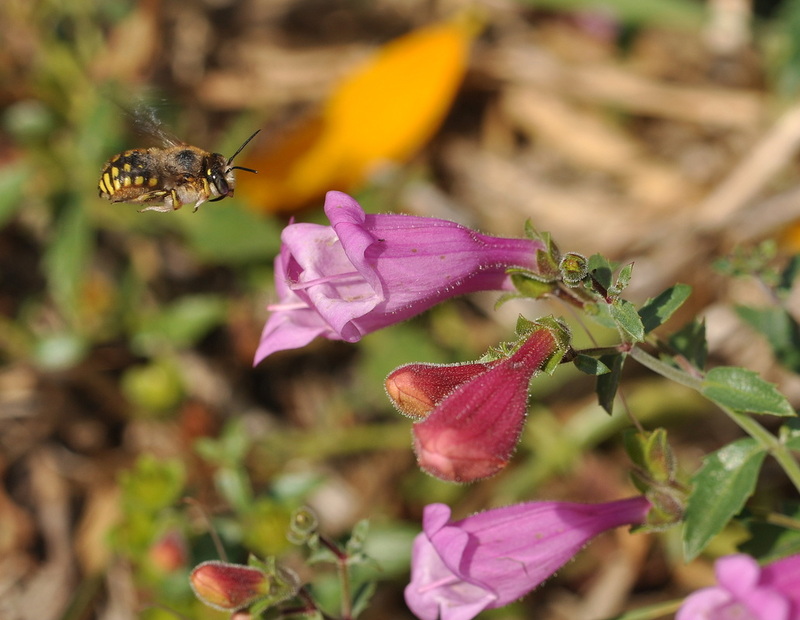 Utilize things like drought-tolerant plants, trees (to extend the canopy), pollinator-supporting plants, use of interesting debris (rocks, wood) to create habitat. Native plant sales, plant donations?